Are you tempted by street food? I always am – no matter where I am on this planet. Sadly, I often refrain from tasting some street food, because I’m trying to make sure I don’t get sick. I wish I could throw caution to the wind and just go for it. But I don’t want to tempt fate – or upset my digestive system while I’m on the road. 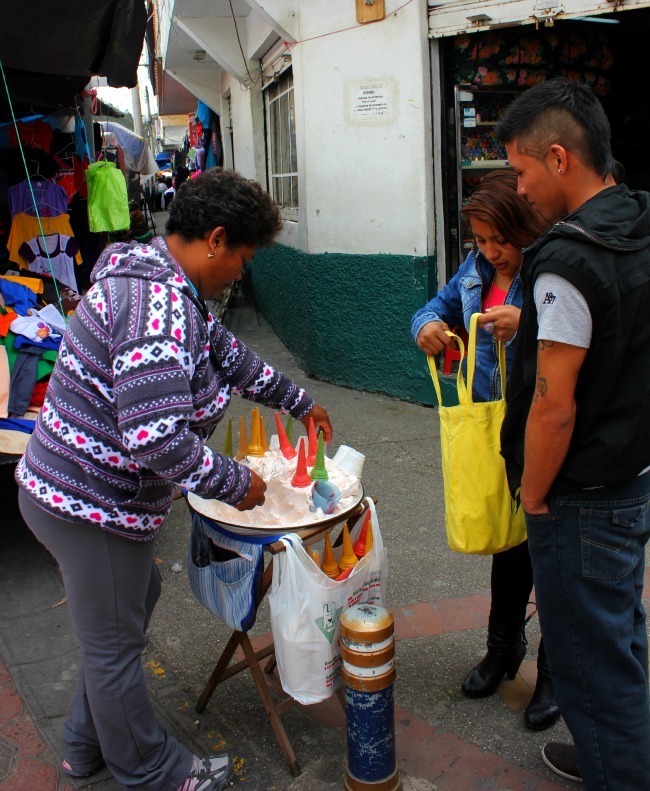 When I was wandering the streets of Quito, I had plenty of opportunities for snacking, but I kept to two safe options: bottled water and coffee. I ignored the freshly cut fruit, the deep fried snacks and the myriad of sweet treats. But I had a hard time saying no to ice cream. I kept seeing these women vending ice cream – huge fluffy mounds of ice cream in a metal tub on wheels, with cones sticking out of the top, just waiting for a customer to select one for a snack. It wasn’t extremely hot, but it certainly was a refreshing treat for an afternoon right? Wouldn’t it be nice to try guanabana? or coconut? or banana? or mango? But no, I couldn’t have ice cream – isn’t dairy a big red flag that says NO – don’t try it off the street. So I refrained, and looked longingly at every possible vendor – wishing I could have some ice cream. In the end, I went into a small store and bought ice cream – lovely creamy coconut frozen on a stick. And it tasted fantastic. And I kept having it as much as I could….and I was glad to satiate my needs as much as experience a local tasty treat, without affecting my health. But I still think about those vendors!